Follow the Data Podcast: Why are small-scale fisheries such a big deal? Dr. Steve Box of Rare's Fish Forever program. The Bloomberg Philanthropies Vibrant Oceans Initiative is the largest philanthropic commitment to internationally reform small-scale fisheries management. One of our partners, Rare, specializes in local fishing reforms, targeting some of the 12 million small-scale fishers that operate 15km from shore. Rare’s Fish Forever program encourages community-led solutions to revitalize marine habitats, regenerate fish populations and help coastal communities reimagine their future. Dr. Steve Box, Vice President of Fish Forever at Rare, has dedicated his career to the study and protection of reefs and fish populations. Fish Forever established an extensive monitoring and evaluation plan while testing approaches to improving sustainable fishing practice. This effort is currently helping Brazil, Indonesia, the Philippines and Mozambique sustainably manage their fisheries, enhance food security, and strengthen local communities. By encouraging more responsible fishing globally, we can protect our oceans and a vital source of food and income for future generations. In part one of a two-part conversation on Follow the Data, Dr. Box and Melissa Wright, of Bloomberg Philanthropies’ Environment team discuss small-scale fisheries. They discuss the results of Rare’s recent Fish Forever review, define good fishery practice, and explore the relationship between data and biology. Be sure to subscribe to Follow the Data so you don’t miss part two of their conversation. Listen on Stitcher – be sure to rate and review each episode! 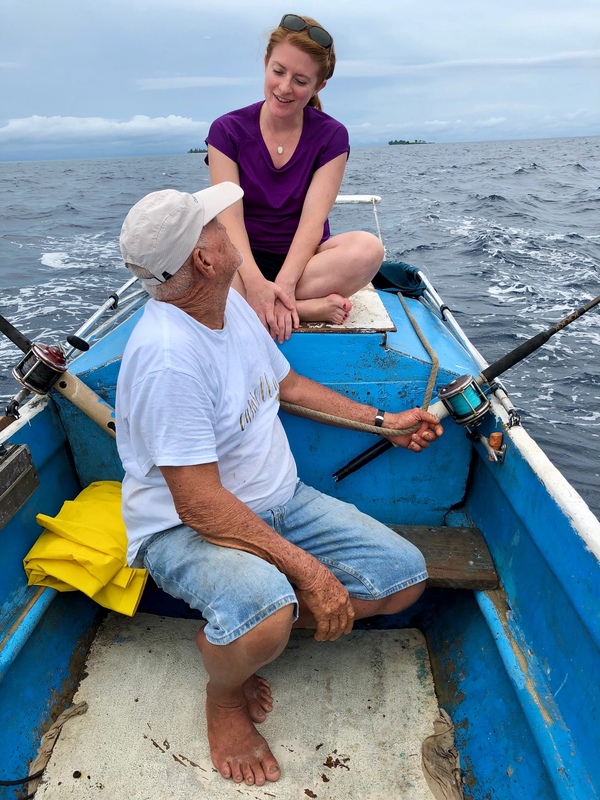 Bloomberg Philanthropies’ Melissa Wright speaks with a local fisherman on a visit in Honduras. Today we’re diving into the depths and exploring “small-scale” fisheries. Fish is the main source of animal protein for more than one billion people around the world, and small-scale fisheries are responsible for 50% of global catch. In January 2014, we launched the Bloomberg Philanthropies Vibrant Oceans Initiative to promote strategies in restoring fish populations and help meet the dietary needs of a growing global population. We partnered with RARE, a conservation organization dedicated to inspiring community-led change. Rare’s Fish Forever program encourages local solutions to revitalize marine habitats, regenerate fish populations and help coastal communities reimagine their future. Dr. Steve Box, Senior Vice President of Fish Forever at RARE sat down with Melissa Wright from the Bloomberg Philanthropies’ Environment team to discuss the program’s results, identify the challenges, and the importance of small scale fisheries to meeting sustainable development goals. This episode is part one of a two-part conversation – so please subscribe to Follow the Data so you don’t miss part 2! MELISSA WRIGHT: Thanks for being here, Dr. Box. May I call you Steve? BOX: You may call me Steve, and thank you very much for the invitation. WRIGHT: We know each other well. We’ve been working together for a couple of years now on the Vibrant Oceans Initiative Program (um) with Rare as one of our lead partners. It’s been fantastic to see the progress that Rare has made in protecting coastal fisheries, and I’m excited to dig into the data a little bit more today. BOX: Me too. I’m all about the numbers. WRIGHT: So, I was reading up a bit more about you, one of your early blog posts at Rare, you were dubbed a fisheries innovator. WRIGHT: I have to say that in the time that we’ve spent together, I think that that title fits. For the podcast audience today, I thought it would be a good way to start by hearing a little bit more about your personal experience with small scale fisheries, your research and if you could kind of paint a picture of what one of these looks like, smells like, sounds like. BOX: Okay. The small-scale fisheries are a specific kind of sector of a fishery. They’re basically small communities or coastal communities that use smaller boats, smaller engine, sometimes no engine at all, paddling out, fishing close to shore. They’re using simpler gears. They’re not highly mechanized, and they’re catching different types of fish. They’re sometimes focused on very specific fisheries, but quite often they’re just looking for a range of fish, or crabs, or lobsters that they sell domestically, and then those fisheries may then connect into lots of other markets. When you think of what’s feeding the world fish, people often think of really big tuna fisheries, and those kinds of things. This is different. These are smaller boats. They’re not using big nets, they’re not using lots of technology. BOX: So, there’s an enormous amount of fish coming in through these very disparate communities, these remote communities. WRIGHT: And where are these communities? Tell me a little bit more about where Rare works and where some of the biggest population of small scale fishers are? BOX: Okay. So, small-scale fisheries coastal community-based fisheries, are found all across the coastal zone and in countries all around the world. We have them in the U.S., in Europe. Again, these are small boats, these localized fisheries, but the focus of Rare is really in the developing countries around the tropics where millions of people really rely on fish for basic food security, food supply, and so the focus is on those types of communities that are all the way across the shore in Southeast Asia and Indonesia, the Philippines and there’s millions of fishers that are really dependent on all of that marine resources adjacent to their communities. WRIGHT: And how does Rare work with those communities? BOX: So Rare is a conservation organization, but it’s a conservation organization with a difference. It’s looking at how people interact with the environment, and how you can shape and shift behavior, so that that interaction is positive, so people can become stewards of those resources that they can help protect them, manage them, make good decisions around them, and it’s all about helping people understand that interaction, and then identifying how they can play a positive role in protecting that resource, but also using it sustainably. It’s not a choice — you’ve got to conserve it or use it. It’s how do you integrate those two sites. So, Rare engages at all levels of society working with communities directly with them, looking at their way of life, how are they using those resources? How can they start using them in a in a better way, in a more sustainable way? How do you bring rights to them? A lot of these coastal communities are disenfranchised from making decisions. They’re not part of that decision-making process. So, how can we work with local government and national government to prioritize that sector of their society, and say these people are inherently responsible for the future of those resources? They have to be a part of the solution, so you’ve got to be giving them rights, helping them make good decisions, helping them understand what’s working, what’s moving forward, what’s a solution, and not just racing to take as much as possible. And these types of communities I would say are a lot closer to natural resources than much of society, people living in cities or with much more advanced market chains, we’re one step removed from nature, and these communities are absolutely dependent on the status of natural resources, so how healthy their reefs are, how many fish there are, and they’re using them for basic needs for food and for the rural economy. So, enabling people to make those longer term plans, but also not at the expense of short term losses, and that’s a difficult thing to balance. How do you overcome that short term gap of a loss in production when you have to start catching less fish because you need to sustain that population into the future? So, we help those communities get through that gap, give them rights, help them manage that resource and also protect it. WRIGHT: What does a well-managed small-scale fishery look like? BOX: That is a great question, and it’s actually quite easy to explain. You need to manage a fishery so that there are enough fish left in the water to reproduce and repopulate so that you can sustain that population indefinitely, so you’re not taking more than come back now. That sounds simple, but it’s actually quite hard to achieve. You need to protect critical areas. So, habitat is called essential fish habitat, so areas that fish live in, you have to be protecting that. So, how do you design where those reserves are going? And that takes a combination of local knowledge and some external science to really work out where the best place to put those reserves are, and then it’s working with the fishers themselves so that they understand why protecting those areas is so fundamental to their fishery, and that they are part of the enforcement and compliance around that reserve, and that involves the communities themselves, it might involve local government, it might involve enforcement, like naval boats or other things, depending on where that reserve is. So, that’s about the protection side of it, but then there’s some basic fishing practices that you also need to change. So, you don’t want to be using destructive gears, so things like dynamite. Obviously, dynamite fishing sounds bad. You’re blowing things out of the water, well, it is bad. It blows not just things out of the water in terms of the fish, but it also destroys the habitat. It turns coral reefs into rubble. And then other destructive fishing like trolling, anything that’s really damaging to the habitat, as well as taking far too many fish at once, and shifting people towards more sustainable fishing practices, so using hook and line, not using really fine mesh nets. These are all fairly simple things to explain, but there’s a lot of participation that goes alongside that so that you actually get that adoption. And then it comes down to basic biology. So, you don’t want to be taking pregnant females. That would seem like a silly thing. If you want the next generation, well, don’t take the breeders out of the population. And you can protect them, either by saying don’t take the pregnant females, or maybe there’s a reproductive season, so you just stop fishing during a specific time of year. Then another very obvious one is well, don’t take juveniles. If you want to have the next generation, you’ve got to let the juveniles grow up to become adults and reproduce. So, you could set minimum sizes. Again, these are pretty basic things that everyone can understand, but trying to really package that into a simple set of management guidelines, and explaining that in a way that everyone can understand and buy into, that’s the trick. The regulations are pretty straightforward, but getting people to really understand how they’re contributing to that. And because we’re all human and we think, “Well, I’m not going to do that, unless everyone else is.” So, how do you shift it so that everyone is following the rules, and that everyone sees those rules as being fair? That’s the trick to good fishery management. That’s the key. WRIGHT: If I know mayors, and I know one pretty well, they look to the data. They want to not only take other’s words for it, but they want to see not only projections for what’s possible but what they’re neighboring city or municipality have accomplished. Rare just completed Fish Forever, a review of a lot of the work we’ve been doing over the past seven years, and some of this was work done in the Philippines. So, those mayors and the community leaders there, they didn’t just have to say well, my constituents think this is a great thing. They’re given more opportunity. They can actually point to real numbers about improved catch and improved numbers of fish in the water. Can you say a little bit more about the findings of the Fish Forever study and what you’re kind of key takeaways were from that that we can be thinking about globally? BOX: Absolutely. When Fish Forever was launched, this focus on global fisheries, and specifically trying to solve the challenge of overfishing in small-scale fisheries, Rare established this very extensive monitoring and evaluation plan to look at what is the recovery in water. So, how are the coral reefs doing? How are the fish doing in terms of abundance and size? And beyond that, looking at how’s the society doing? How are some of the policies changing? So, there’s this enormous range of things that were being measured both through water surveys and through household surveys and interviews. Over the five years of Fish Forever, plus some of the time that we’ve been working in those countries anyway that led to the seven years’ worth of data for some of these communities, we had an enormous amount of information that we could then analyze to look at not just the change ecologically, but also the change in society. The results are incredible. They show that the approach is working, that setting up managed access with reserves, fully protected areas, giving rights to communities is providing complete protection of these reserve areas. So, the fish in the water are reproducing, they’re recruiting back onto the reefs and we’re seeing an amazing change in life in the water. So, to give you an example to give you some hard data, over the seven years’ worth of data that we had, we saw a 390% increase in the biomass, so that the amount of fish inside reserves. It’s just an incredible recovery story, some of these reserves had already been established before Rare was involved, but there had been no real enforcement, and it’s very hard to enforce reserve if the community themselves do not realize and understand why it is important. By really driving that understanding and empowering communities to protect the reserves, we start to see the biology kind of take care of itself and really start to recover. But even more excitingly in the water, around those reserves, we start to see more fish in the fishing areas themselves and that had gone up by 111% over the same timeframe. And what we see over time is there’s a gradual change in the first few years, but not statistically significantly different, and then it suddenly starts to jump. After four years you get this incredibly rapid recovery. That’s biology at work. That is the time it takes for the fish to reproduce, for the eggs to hatch, for the larvae float around in the water, for the small fish to recruit back into that area, and grow, and be counted. So, there is this natural time lag, and that’s a really important part of the data as well. We can start setting the expectation of communities about how long they’ll need to invest their effort in protection in order to start to see the recovery, and that’s about three to four years, you start to see this recovery happening, and after seven years you see it both in the reserves and in the fishing areas around the outside. So, the data ecologically, are really, really compelling really, really exciting, but what we see in the shift in society was equally exciting. We conducted about 15,000 household surveys and interviews asking people about their perceptions of reserves, what they think about marine management in general. How is it helping them? Were they part of it? This whole range of questions. Over the course of the program, we start to see shifts in how people are answering those questions, “Do they believe that the reserves are important to them? Do they feel that the rules are fair?” We’re starting to see the answer being “yes,” that people believe that this type of management is beneficial to themselves, beneficial to their communities. They feel more involved in that management. There’s this participatory process where they feel engaged. Also the level of trust is going up, and that’s a really important thing in human society, very hard to build, very easy to lose and to see trust amongst the community, but also trust in government, and again looping this back to the role of especially of local government, if you have the information showing that that things are changing, you have strong leadership, communities feel that and they start to believe that yes, the government is representing their interests, the decisions that are being made are fair and equitable, and that creates the hope that can actually sustain that change long enough for the biology to really kick in. To me, that is the core piece of Rare’s work and Fish Forever’s work is to generate that belief that change is possible, encourage people to make that leap of faith to really enact with change, and then provide the evidence base to sustain that change long enough for the biology to really kick in and recover. And so over the course of the project so far we’ve got this incredible evidence base, and now we’ve just released a global report, which used the data from 250 communities and 2,500 in water surveys, these 15,000 household surveys, and looked at these trends, these changes in all of the places to show this wasn’t just a one-off. This was something that was happening everywhere we were seeing it. And we then downscaled that to look at a country. So there’s country reports, or what’s changing in Indonesia? What’s changing in the Philippines? What’s changing in Brazil, and then even more importantly, in my mind, we’re taking it down to the sites to the communities to provide that information, not about global change, communities are obviously interested in what’s happening in the world, but they really want to know what’s happening to my fishery, to my area. Is this working for me and my community? And so, being able to provide local information back to those local communities, that’s an incredible closing of the loop between engagement, collecting the information, analyzing it, and then bringing it back, so it’s a really exciting time in the program. WRIGHT: A minute ago you mentioned the leap of faith that communities have to take about the level of investment that they’re making, the level of, sort of personal sacrifice potentially, for the greater good of the community and the resource. Can you say a little bit more also about the leap of faith that provincial or national governments need to make in order to invest in the infrastructure to support small scale fisheries? I know that. What is it that the other countries should be aware of, and begin to consider, or be able to learn from Rare’s experience to be able to make similar kinds of changes in their country and in their coastal communities? BOX: So, the first phase of a Fish Forever was kind of two-pronged. First, we wanted to test that this approach worked, so we selected lots of different communities across the coastal zone of different countries to really look at can you connect these rights, set up this managed access area so specific communities are allowed to fish in specific areas, establish reserves to protect critical habitat, and a proportion of the fish population, establish management bodies, and decision-making bodies, and establish the data collection systems that they could use to make good decisions, so that was one path. The parallel path was looking at how important would fish recovery be and reversing the decline of fisheries be to a national government, and that used projection modeling, it used available fisheries data and fish biology data. It looked at current fishing pressure on the trends between industrial fishing versus coastal community fishing and what would happen under different management scenarios, and the results are really interesting as well in that again separating out the industrial from the coastal community fisheries provides a real benefit to coastal communities, which would seem logical, because there’s much less competition, but then by building the management within those coastal communities that then provides the mechanism to sustain those fisheries into the future, and that was modeled for the whole of the Philippines, looking at what the recovery would look like, how much it would likely cost to make those transitions and really implement effective management. And that provided an evidence base that enables national government to look at this as a serious development choice rather than it being elusive. We know they’re important for food security and employment, but there aren’t very good numbers on that. This really is providing the evidence base that people can sit down and look at, okay, this would be the investment and this is the return on that investment for all of these different angles in terms of fish production, in terms of revenue back into the economy, in terms of employment and start to bound that in time and that’s how you make good decisions as a government. WRIGHT: Thank you. Tell me how did you get involved in this work? What inspired you? What brought you to the place that you are at Rare? BOX: That’s a good question. I’m a marine biologist. I did a PhD studying coral reefs, and I was looking at how reefs interact with other things that live on a reef. There’s an incredible fight for space between algae and corals, and it’s mediated by fish. So, fish eat the algae, create space for corals to grow, and that’s how you have a really coral abundant ecosystem, if you have a lot of fish. And so that was my kind of early work looking at that interaction. It got me more interested in the fish part of it. So, I moved up the food chain and started looking at what’s impacting the fish abundances, and that clearly led me to fishing, because that is one of the biggest pressures on fish populations. 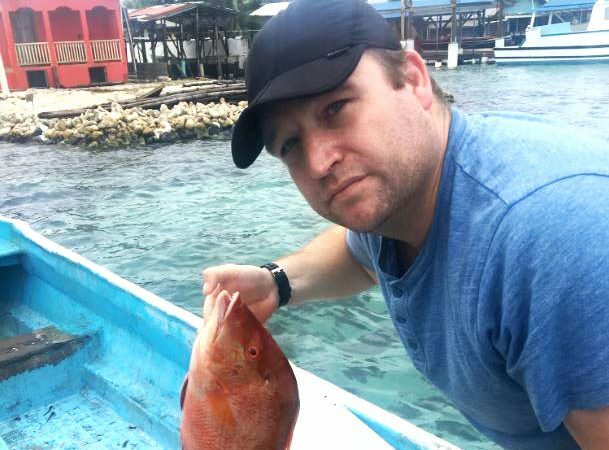 I was based in Honduras and I was working with coastal fishers and looking at how they were fishing, what they were fishing, where they were fishing, and how that linked to fisheries health, but also back to these reefs. The more I started working with the people that depend on reefs, the more interested and confused I became because there just wasn’t any information. I wasn’t a fisheries biologist, I wasn’t a fishery scientist, and I was asking what I thought were really simple questions like, “how many people fish? How much are they catching?” And no one could tell me. So, that opened up this Pandora’s Box, which was the next 15 years of my work looking at how would you solve what seemed to be really simple issues, and data issues, but how could you solve them across vast scales where you have millions of people, where you’ve got disparate communities? So, I started looking at data collection and fisheries, and then how could you actually protect areas? How could you design reserves that really function both to protect the fish, but also to sustain the fisheries? So, I moved from working in a small NGO, I then worked at the Smithsonian, and I ran a research group there that looked at the science you would need in order to design reserves and collect data that you could feed back into that system. I learned more about Rare in the coastal fisheries work, and it was a natural fit. This was an NGO working around the world to solve the problem that I’d been studying for an incredibly long time. And by linking that kind of background from the science, from the data collection with a practical application through community mobilization, through behavior change. It’s literally the perfect job for my skill set in that background of science, but how do you turn science into action? And that’s Rare, it’s taking the best available knowledge, inspiring communities, making change and being able to measure the impact of that change. So, it’s been an incredible time leading this program. I work with an incredible team around the world, about 80 partners around the world, partner organizations, hundreds of people, not paid by Rare that all invest their time and energy into solving this problem and we work with national governments, local governments, local communities, women’s groups, indigenous groups. It’s just an incredible range of people involved all in solving this one problem. How do we stop coastal overfishing, and how do we really reinvigorate and revitalize marine life? And it leads all the way back to my roots of how do we sustain coral reefs, because they’re so fundamental to life on Earth. WRIGHT: Well, hearing all this gives me a lot of hope and inspiration. I am really looking forward to continued work with Rare and the coastal communities around the world. OLIVER: We hope you enjoyed this episode of Follow the Data. Many thanks to Dr. Steve Box for joining us. Visit Rare.org for more information. If you haven’t already, be sure to subscribe to Follow the Data podcast and tune in for part two of the conversation between Dr. Box and Melissa Wright. This episode was produced by Electra Colevas, Melissa Wright, Ivy Li, music by Mark Piro, with special thanks to David Sucherman.